The Monprivato vineyard emerging through the autumn mist. Barolo MONPRIVATO “Cà d’Morissio”: a historic clone in a new vineyard. Barolo MONPRIVATO has always been produced using 100% hand-picked Nebbiolo grapes selected as a true expression of this vineyard located in the village of Castiglione Falletto. Under the DOCG regulations governing the production of Barolo, a yield of 8 tons/ha is envisaged for the 6.13.12-hectare MONPRIVATO vineyard, giving an annual production potential of 41,600 bottles. The actual output, however, varies between 14 and 24,000 bottles, depending not only on the climatic conditions of the vintage, but also – and above-all – on stringent winter pruning of the vines, berry-thinning in spring and summer, and uncompromising grading of the picked grapes. The Michét and Lampia varieties give the wine color, structure, personality, and the ability to stay young for many years. Rosé provides delicate aromas, elegance, a soft color and little structure. When the Nebbiolo vine is planted on outstanding wine-growing land it is capable of expressing itself at sublime, peerless levels, in this area producing Barolo, a wine brimming with qualities that satisfy the senses of smell and taste completely with its velvety tannins and the intensity of its bouquet. 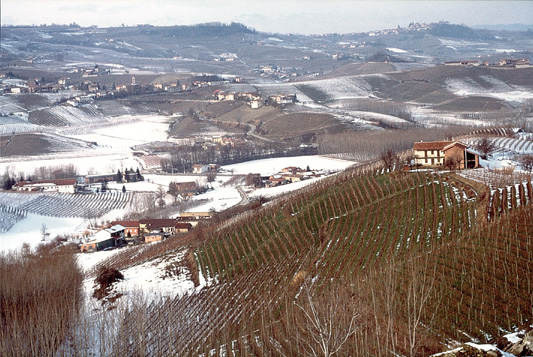 This is the case, for example, of MONPRIVATO, which – given the location of the vineyard on white, silty-calcareous soil full of active limestone and micro and macro-elements – produces a Barolo with a delicate, intense, elegant nose; ample, smooth tannins packing it with polyphenols; complexity, a long-lasting flavour, and bright – though not intense – anthocyanins.